Just got back from sushi w my sister Jennifer.. by chance, @dereksherinian walks in. Had some last laughs of 2012. Happy and Healthy 2013! Thanks for your support in 2012. 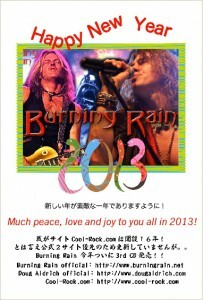 Burning Rain will release the 3rd CD this year. We are very much excited and hope to see you all in 2013! May the New Year bring you happiness, peace, and prosperity. Hey guys, thank you for all the Christmas wishes. Happy Holidays and a Merry Christmas wherever you are.